A scene from the IMAX® film A Beautiful Planet – The vivid colors of the Bahama reefs. 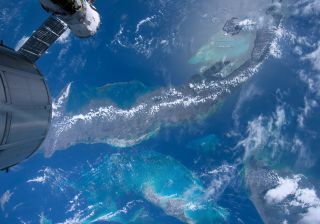 The new IMAX documentary "A Beautiful Planet," filmed by astronauts on the International Space Station, illuminates life on the station and the beauty and fragility of the Earth it overlooks. The film, which will be shown in IMAX theaters on April 29, incorporates 15 months of footage from the space station, and offers a rare glimpse of Earth from afar as well as insight into the day-to-day activities of the crews that lived and worked on the station during that time. The film's narration, by Jennifer Lawrence, also delves into the impact of humans on Earth and its potential analogues elsewhere in the Milky Way. "When you look out the window of a spacecraft, even though you're off the planet — which is, for one, pretty amazing — you see the frame of the window around you," Ivins told Space.com in an interview. "What IMAX does is take the frame away and stick your head out the window. It's like hanging your head out the window of a spacecraft and watching the Earth go by." The documentary captures crew arrivals and departures, astronauts sampling NASA's first lettuce grown in space and other big moments, along with the smaller moments of astronaut life. Most of the filming happened on weekends and during free time, and the astronauts' unscripted observations after they landed formed much of the film's voiceover descriptions. Except for certain specific scenes, the astronauts were largely allowed to document whatever they wanted aboard the space station, Ivins said in a roundtable discussion on April 15. "As [director Toni Myers] says to the crew, 'This is what I'd like, but at the end of the day, you are the ones with the camera. You are the directors, you are the writers, you are the producers." "If an alien knocks at the window, don't not shoot it," she added. The film's story unfolds over the course of 45 minutes, combining views of Earth and the station with visualizations showing the effects of climate change and human activity on the planet, as well as Earth's place in the broader galaxy. "A lot of people, I'm amazed: They think outer space, the moon, Mars, it's all the same," Myers told Space.com. "People don't realize, just to get to Mars is 49 million miles, [and] another Earth is — we're light-years away from having the technology to get there." Instead of that fact leading to hopelessness, Myers said, she hopes that understanding will inspire people to take care of Earth and look for solutions: "There's a couple of examples where human beings have got together and actually done some improving," she added, so she's hopeful. Myers also directed "Blue Planet" back in 1990. While much of the process is the same, with astronauts orchestrating their own shots and getting crafty with how they set up and move throughout the station, this is the first time it's been shot with digital cameras. Consequently, it's the first time that the members of the crew have been able to shoot footage for IMAX of the lights of human habitation on the Earth at night, or the swooping auroras that can cover its surface. "I shot some aurora," astronaut Kjell Lindgren said at the roundtable. "And it looks unearthly — it looks like a special effect, and it's not. You're floating there, and you're watching this, like, 'My goodness. I can't believe I'm seeing this.' And then you also realize that it's because of radiation that's coursing through your body." The astronauts' shots also captured how the Earth is changing, said astronaut Butch Wilmore. "When you think of deforestation or fracking fires, those types of things, before this film, what did you have to compare to?" He and the other astronauts filmed deforestation in Madagascar and fracking fires in southern Texas, along with other sights that highlight humanity's mark on the world, like the stark borders between countries in conflict. Ultimately, in describing the film, the astronauts came back again and again to how much it conveyed the feeling of being in space as fully as possible: "It's impossible to share the whole thing without actually being there, but I think this is probably the closest you can get without doing that," astronaut Terry Virts told Space.com. "We live on the space station, and it provides us food and water, protection from radiation — it's our place to live, what we call home," Lindgren said. "When you look at the Earth from that perspective, and you can stick your head into the cupola and you can see the full face of the Earth, you see that it is this beautiful blue and white ball hanging in the cold void of space. And it provides us with food and water, protection from radiation — it's our home. And yet we don't spend anywhere near the amount of time taking care of it that we do of the space station." "It's kind of a profound realization that you really don't get to experience when you're living here on it," Lindgren said. "You look up at the blue sky, and it's beautiful, but when you look back at the Earth you see that it's unique, and fragile."